From the rapidly rising, critically acclaimed production company Black Fawn Films, the producers of Bite, comes the critically acclaimed The Resident (aka The Sublet), ‘One of the most effective psychological horror films of the decade’ (horrorgeeklife.com), which makes its UK DVD debut and available on-demand and to download this May. Alone with a baby and feeling isolated, Joanna feels a growing sense of unease in her new apartment. Are the sinister noises, banging on the walls and whispering voices real, or is she losing her mind? Gradually uncovering the chilling history of her new home, she desperately clings to her sanity, while fearing the horrific events of the past have left a very real and malevolent presence. Prepare to be disturbed as you spend some time with The Resident. 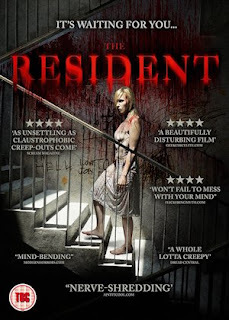 The Resident is released to UK DVD & VOD May 22 courtesy of Second Sight.